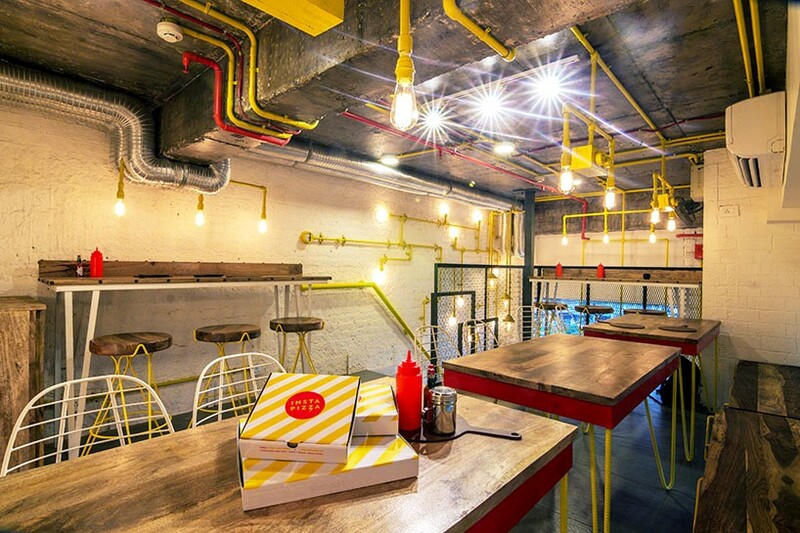 RENESA architecture design interiors has added a new touch to an upcoming pizza chain in new delhi called ‘instapizza’. the concept of the design was to capture the relationship between those who love food and design. the philosophy of the pizza outlet clearly demanded the use of mechanized forms of design to showcase the essence of the pizza process to the foodies who visit it. a pipeline light installation has been included to guide the visitors to the various pocket-spaces so they can seat down and eat. the rough finish given to the plaster brick wall adds an essential element to the western-like atmosphere. as for the space constraints, the studio decided to use all the height of the volume and provide a mezzanine floor, hence dividing the outlet into two horizontal parts — a kitchen entrance on the lower level, and the seating and eating area on the second floor. the use of perforated industrial steel railing was used in certain areas to allow natural and artificial light to flow throughout the space, as well as giving a sensation of an area that expands. the outdoor ambiance was taken care of with the help of glass decals which were designed according to brand strategy and its aim is to attract the audience. 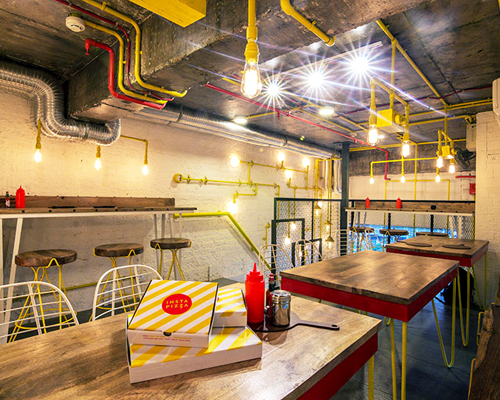 the idea was not only to provide the customers with great pizza but also to give them a youthful space for them to interact with. hence finding that right blend of architecture and gastronomy for the user’s delight.